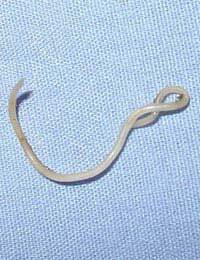 Toxocariasis is a parasitic infection caused by a helminth parasite – the round worm that can infect dogs and cats. Transmission to people occurs as the parasite is passed from the faeces of a domestic dog or domestic cat to either a child or young adult. Infection in people who are undergoing medical treatment that affects their immune system can also be vulnerable to toxocariasis infection. There are three main forms of illness that can occur in someone infected by toxocara. There is a very mild form, a generalised form in which the parasite damages several body organs and the specific type in which the worm only grows in the eye and optic nerve. This type of toxocariasis can cause blindness. In some cases of children with toxocara eye infections, they are initially thought to have eye tumours, as some of the signs and symptoms are similar. The very mild form is often not diagnosed because it produces symptoms that are very similar to other illnesses, such as flu or infectious mononucleosis (glandular fever). It does resolve in a few weeks as the body fights off the parasite and destroys it. In people whose immune system is weakened, the parasite can get more of a hold and cause infection of major organs. In very extreme cases, the heart and brain become inflamed and toxocariasis can be fatal. Toxocara infection in the eye can be the result of just one parasite gaining access to the inner part of the eye. Usually, only one eye is affected and the infection does not pass across to the other eye. The affected eye becomes very inflamed and red, and sight deteriorates as the parasite destroys the retina and light sensitive cells. Large swellings called granulomas can form in the eye, which look very like tumours when the eye is examined. Advanced toxocariasis in the eye can lead to permanent blindness. Younger people – children and young adults – are the most common hosts for toxocara. After that, most older adults develop immunity to the parasite and are not affected. Humans are said to be an accidental host of the parasite – we do not really feature in the life cycle of the parasite and it cannot mature to complete its life cycle in the human body. Its natural hosts are the flea and the dog or the cat. Places in which dogs and cats and other domestic animals live in close proximity to humans provide good conditions for transmission and toxocara is more common in developing countries. It can also occur in overcrowded, less than hygienic homes in the UK in which there are maybe several dogs and cats, none of which are wormed regularly. It is important to avoid transmission of the parasite from animal faeces to the mouths of children and young people. Sensible precautions such as cleaning animal litter trays, disposing of animal faeces from public places, and always washing hands after touching a dog or cat can help. It is also crucial to treat pets regularly with a good worming agent, particularly pregnant dogs, as the parasite can pass from the mother to the puppies in the few days after birth. In regions where domestic animals mix with cats and dogs and people grow their own food, it is important to keep the animals away from the growing vegetables as the parasite can pass from animal faeces to the leaves and can then be eaten unknowingly as they are not easily washed off with water. Cooking meat properly is also important in developing countries, as cow, pig and sheep meat can all contain active larvae from the parasite in the muscle and offal.